HandBaked.com presents Apps flying out of the oven! Clever entertainment and other apps for iPhone, Android and Tablets. By using soundboards, narration videos, ring tones, personalized greetings and other in-app purchases -- HandBaked delivers apps that receive 5 Star Reviews. Fans that enjoy our apps are loyal. Speak with an App Chef! Randall's Official iPhone App is Here! * Navigate through boatloads of Free exclusive & hilarious sound files. Find the outgoing message you want to use, and then record it to your voicemail. * Use your phone cam to record your own video for Randall to narrate. * Swipe through Randall's hysterical videos. * Get Ringtones by simply choosing from lots of exclusive Honey Badger Don't Care audio files. * Exclusive Uncensored Soundboards feature Randall in all his off the cuff splendor. HandBaked develops Apps across multiple platforms. Our App Chefs administrate the app store and marketplace compliance processes. HandBaked then assists with lead generation, sales, and all aspects of App monetization. App fans enjoy timely support to make sure fans expectations are exceeded. Our Passion is Making Apps! HandBaked is the kitchen, Brand and Content partners are the ingredients, the apps are the main courses and the fans of the apps are our voracious diners. Everyone wins! In a nutshell, the App markets are exploding in popularity! 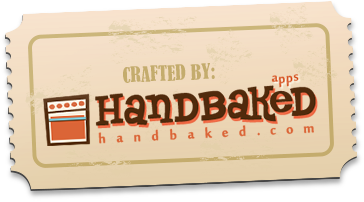 HandBaked does it again with HarlandApp.com! HandBaked releases RandallGrams for the Official Honey Badger App for iPhone/iPod Touch! Randall's Official Honey Badger App goes live and the world loves it! 5-Star Reviews are the norm for HandBaked's first commercial App!